The driveway to the south of the house has often been a gateway for wildlife to get from the backyard to the street. Since I don't have a garage, it's easy to run along the drive and make a left turn into the front yard. Rabbits use this all the time. One year, Carole had taken one of the garbage cans to the curb, turned around and saw a skunk in the drive. Last night, I pulled in after work and got out. My eye was attracted to something brownish that seemed to fall into the drive along the house. It took me a minute to realize what it was. 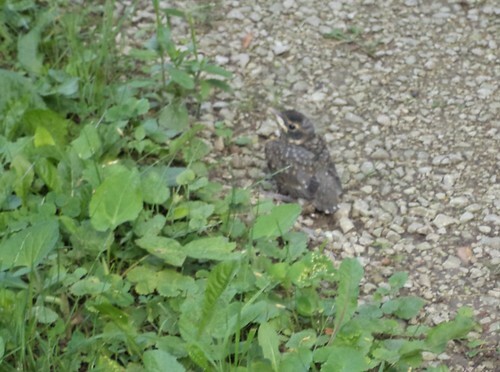 It was a fledgling robin. My neighbors have a large pine tree just south of the drive, off the northeast corner of their house. They also have a bird's nest at the immediate northeast corner, tucked between the house and the "S" curve of the drain pipe. As I approached, the bird hopped along the drive to get away from me. I couldn't see a nest in the pine tree, but that doesn't mean it's not there. You can see that the rear feathers are not fully developed. All it seemed to be able to do was hop. After getting my picture, I left it be. I decided not to bring the recycling can back from the street because I'd have to maneuver it by the bird. It's in enough shock to have tried to fly and fell. It didn't need to contend with a human and a big blue recycling container. This morning it was not in the drive. I walked it to be certain. I am rather thankful that I don't have outdoor cats. Betsy, Rascal, Shakespeare, even Penny or Half-Pint would have loved this. "Oooh, thanks mom. Dinner." Speaking of dinner, there's been a morning visitor to the front yard. I eat my cereal and have this guy staring back at me. I know they can see me because if I throw up my hands, he will take off. The girls will notice him but they seem uninterested. Squirrels on the deck, yes. Rabbits in the front yard, no. 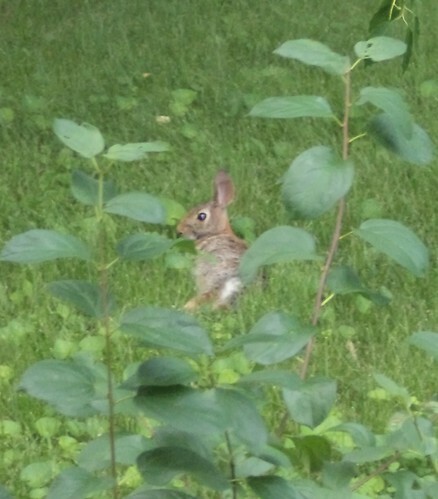 I like that there is an abundance of wildlife, even of what could be considered a slightly mundane type, in my yard. As overgrown as it is this year, with all the rain, I'm providing a decent habitat. In return, a good habitat provides me with a healthier environment. Plus, when Mija is sitting on the magazine I want to read with my cereal, it gives me something to watch over my Cheerios.